The sixth British Food Fortnight runs from 22nd September to 7th October 2007. It is the biggest national celebration of the diverse and delicious range of food that Britain produces. In my quest to make something British and slightly different, also using a local ingredient, I looked through various books and searched the Internet until I came across the All British Food website. There I found a great recipe, with a fabulous name, that used cob nuts (or hazelnuts) from Kent - my own county. I bought my cob nuts from the local farmers' market, shelled and roasted them - but you could use any nuts - pecans would be good too. Don't skimp on the lemon rind in this recipe, it really adds a zing, and try and use all butter puff pastry if you can find it. 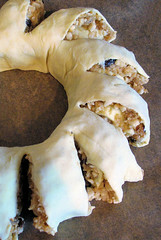 Roll out the pastry into a rectangle, about 10 x 14 inches. Cream the butter and the sugar together until pale and fluffy. Beat in the egg and then stir in the cake crumbs, hazelnuts, raisins and grated rind of the lemon. Spread the mixture over the pastry to about half an inch of the edges. Roll up lengthways (like a swiss roll) and place on a baking sheet, lined with baking parchment paper. Twist into a circle shape and seal the ends together. Snip into the ring at 1½ inch intervals, being careful not to cut right the way through. Brush with beaten egg to glaze and bake at 220ºC (425ºF) for 25-30 minutes. I tuned the oven down slightly for the last 10 minutes as it was nice and brown on top, but still needed a bit longer. Sprinkle with caster sugar and serve warm with cream, it's also good cold. That looks so good. I never realised cob nuts were a type of hazelnut. What a wonderful start to your first blogging event. The cartwheel looks wonderful. Lovely looking dessert Nic. I didn't know cobnuts were a type of hazelnut either. It makes sense though! Glad to know you have your new oven up and running! It appears to be doing a wonderful job! Jules and Marie - I didn't know that they were a type of hazelnut until recently either. Margaret - I have been doing blogging events for a while now, but this is the first time that Hippolyra of Fuss Free Flavours has hosted one! Mansi Desai - thanks for visiting! Your mocha-hazelnut coffee cake sounds delicious! That looks wonderful! I got some cob nuts from some trees on a nearby street in Central London the other week. I am going to be cooking this one! thanks for taking part in my event - check back next week for the round up! 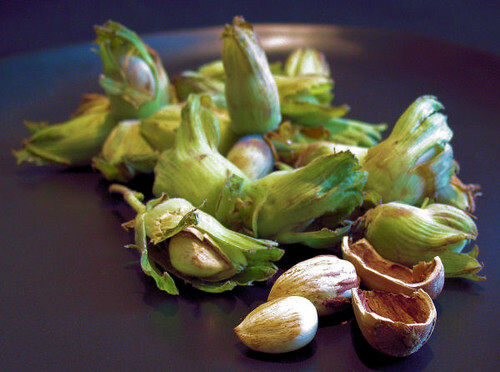 I love cob nuts, we have them growing wild just up the road. I think I may have to try this recipe Nic, it's looks wonderful...but there again your photos are always brilliant! Just love your pastry wheel!!! !Looks at all those wonderful flavours of hazelnuts and fruit peeking out! Cheers from the states! What a fantastic blog site you have. Love your recipes. I look forward to reading you often. Hi Nicisme, I'm back from a class and came to your site. 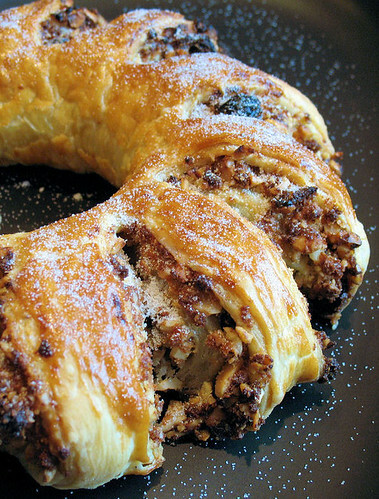 Your Hazelnut Cartwheel looks divine. I love hazelnuts (cob nuts apparently), and the combination with puff pastry, lemon zest, sugar, and butter sounds truly delightful. Funny that it's the British Food Fortnight, because we had a British woman from Bristol in our class used "fortnight" and none of us knew how long that meant. Well, now I know, so a two week celebration of food sounds like my kind of adventure. Thanks for sharing your recipe! Thanks for hosting the event Hippolyra, can't wait to see the entries! Hi Valli - thanks so much! Welcome to my blog Patrick - thanks so much for visiting and for the great comments! I'll be popping over to yours later....! Hi there Bri - I thought everyone knew the term 'fortnight', how funny! I guess we both learned something new!! What are you studying in your class? That looks amazing, but sounds do-able! Well done you! Thank you for giving me a nice welcome back, to my blog! This looks magnificent! I'm so impressed by the looks but I know the flavors are wonderful as well. Hello Holler - so glad you had a great honeymoon, can't wait to see some more photos! Patricia - lovely to have you back and blogging again - we missed you! That looks amazing! And I love that it's called a cartwheel. Thank you Brilynn. Isn't it a great name?